On Monday's episode of "The Colbert Report," Stephen Colbert defended the new "Star Wars" lightsaber. The new lightsaber was seen in the trailer for "Episode VII"
(CNN) -- When the first trailer for "Star Wars: The Force Awakens" arrived last week, it posed one of the most pressing questions of our time: Is that new lightsaber design awesome or absolutely ridiculous? In the "Force Awakens" clip, we see a hooded figure whip out a lightsaber that has two mini-lightsabers protruding from its sides, essentially forming a lightsaber broadsword. Some fans were immediately all about the new lightsaber, but others were far less impressed. Listen... I'm as happy as anyone else about the Star Wars trailer. But really with that lightsaber hilt? For many, the biggest issue was that the weapon's design seemed flawed. But here's who we hadn't yet heard from in this debate: bona fide "Star Wars" superfan Stephen Colbert. You see, Colbert has been a "Star Wars" fan for at least two weeks longer than you have, since he won tickets to an advance screening two weeks before the first "Star Wars" premiered in 1977. And according to Colbert, the new lightsaber's design "is awesome" and "perfect." "It's a lightsaber with two mini-lightsabers on it! It's a menage-a-saber," Colbert crowed on "The Colbert Report" Monday. "Sadly, there are some stuck-up, half-witted, scruffy-looking nerfherders out there who aren't thrilled with the new Jedi weapon." 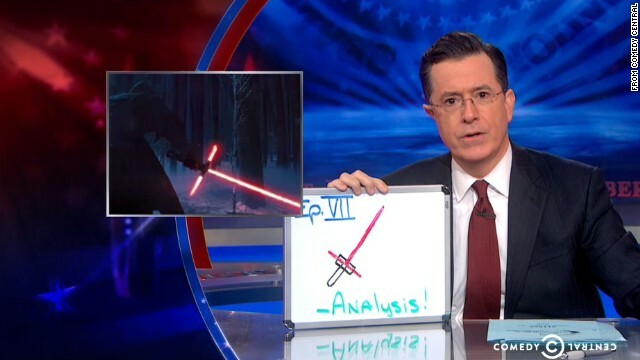 So to all those who may fall in that camp, may we present to you Colbert's detailed analysis of why the new lightsaber will work -- complete with whiteboard.